Blue Swan Navigator = Serendipity & ROI Driven! Serendipity can never be predicted but since the 27th of December 2014 it can timely be invoked in a systematic way. This paper is dedicated to: Nikola Tesla, Everett III, Joop den Uyl ( he made it possible for me to study ) and Jan-Peter Balkenende ( for his call for the VOC-spirit of guts in 2008) which I transformed into the World Trade Port, a VOC 2.0 with the same spirit but “Fair Trade” added. 1-About serendipity and the Unknown Unknowns. Unfortunenately serendipity has it's mirror word which is unserendipity.Like many small serendipity events can lead to a Blue Swan, a quantum leap, many unserendity events can lead to a Black Swan, a disaster. By persuing serendipity in science, projects and daily life in a systematics way Quantum Leaps/Blue Swans can be stimulated and unserendipity and Black Swans can be prevented to occur. 3- Shell's factory explosion and later on a steam incident in Moerdijk, the Netherlands. 2 black swans after each other which strikes all plants. But there was also a serendipity part on this disaster: Nobody got injured. The percentage of project failures does not change much over the years. It is still about 25 to 60% depending on the definitions used. Here one of the many articles published: Are These The 7 Real Reasons Why Tech Projects Fail? But despite of so many projects done over the years and all the management books and methods project management still is a dragon with many heads. 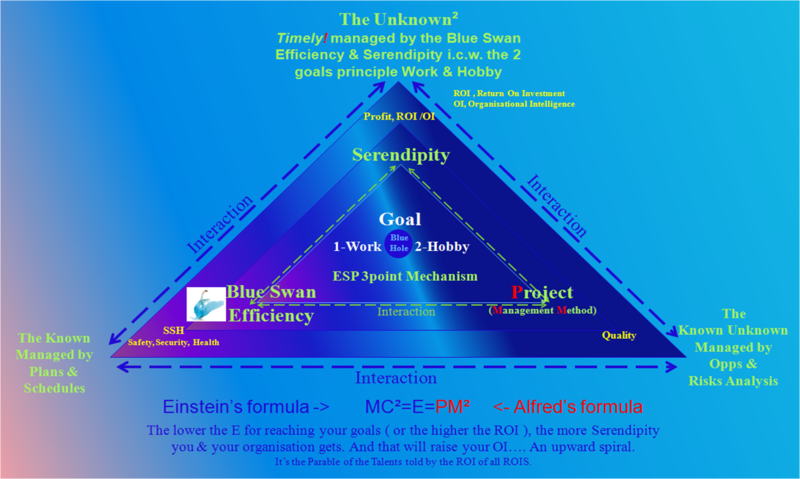 The Blue Swan efficiency and serendipity approach, as an add-on to the project management methods used nowadays, will be a breakthrough. It will not change used management methods for management of the Knowns and the Known Unknowns. But it simply adds a systematic method to deal with the Unknown Unknowns. See further below. Above figure shows that project management started with network planning after WO II. Before that they used Gannt barcharts. In 1984, as a Shell employee, I started to make barcharts with with pencil and paper first, later on with lego blocks but in 1987, with my first HP150 and Lotus-123 I made my first barcharts with a computer! Then my first network planning with the mainframe computer on the Artemis 9000 planning software. I was a exiting time. With the PC version Artemis 7000 we made the schedules of several factory Turn Arounds much shorter from 8 weeks to 6 and later on to 4 weeks. It was a big contribution on Shell's ROI. A scheme of controlling Turn Arounds ( Dutch Version ): The Generator Model first issue was in 1997. In the 1990-2010 we slowly "added" chance risk analsys into the schedules. Now Primavera P6 schedule software with Risk Analysis on board is standard in many companies. Also risk management found its way to the universities and science. 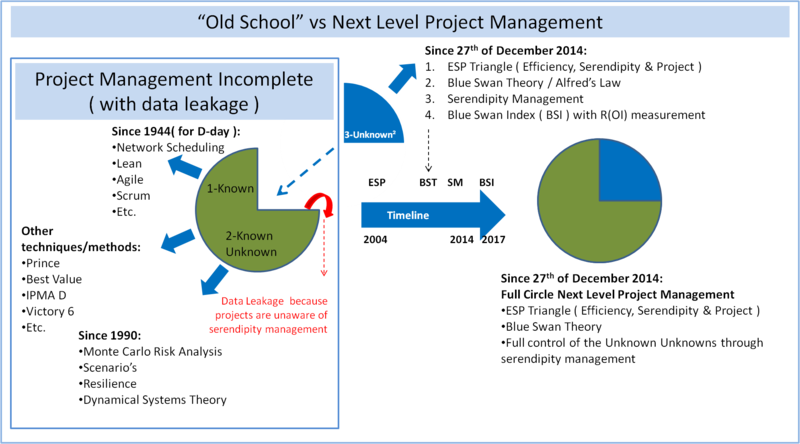 The last add on, which is a logical evolution to complete project management, will be Serendipity Analysis , to control the Unkown Unknown in projects in a systematical way. The app to make this connection possible is underway...scheduled beginning of 2018. My best estimate is that the Project, R&D and Political world will not fully understand and dig this Gold Mine before 2025. In the model above the key is the Blue Swan efficiency ( --> generates a higher ROI & safety ) , which is reaching goals at the cost of nothing at all. Your efficiency can be maximised when work & hobby goal are balanced, so ideas can flow from both sides influencing eachother. When all team members of a project are aware of this mechanism there will be full interaction within a project. The result is more efficiency which opens the gate for more serendipity. Serendipity within a projects is a two sided sword. It will make the project time shorter and your ROI & Safety higher. And sometimes you get a quantum leap. What you also need is "a fight for every inch"- spirit. Keep you stepping stones and end-milestone in place again at the cost of nothing at all. This will boost up co-operation. Many project management methods are developed and ERP, scheduling and risk software are made to get a grip of the project goal, time, resources, costs, safety, ROI etc. Now we have BIM software that we can connect with the project management software. 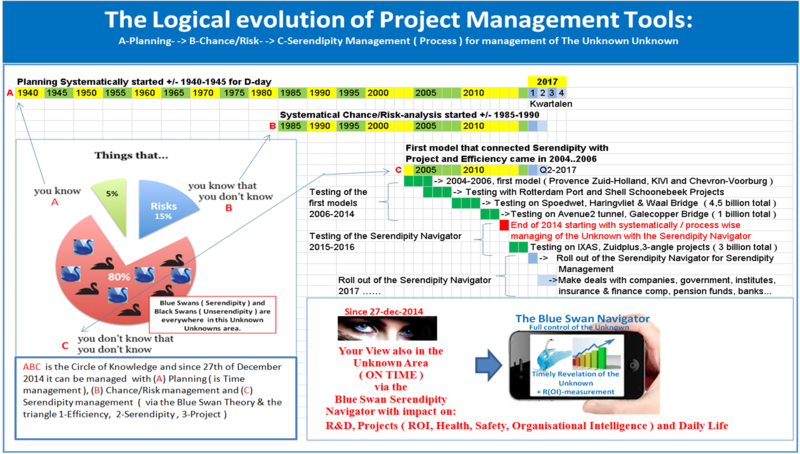 Since end 2014 the gap of managing the Unknown Unknowns is closed by the Blue Swan Serendipity management method described below in chapter 5. The Blue Swan Serendipity Navigator or Serendipity Generator contains 3 elements and the Organization Intelligence measurement. The Blue Swan Index app is under construction now. In Q1 2018 the project community can log in and bring in their projects to follow up. Meaning: To build a Project from Idea to Completion needs an amount of Energy which is depending on the Management Method. If there is no Goal there is no Project, no Will and no Way also P=0. The Will: If you show some guts, courage ( not recklesness ), a Fight for Every Inch-strategy it will pay off in time , BS-efficiency and Serendipity. And serendipity will make the Way to reach you Project-Goal easier ( in defining of your goal and easier alternatives, working ways ). Above figure shown that is is better for projects to move into the Blue Zone. When this knowledge is wide spread the economic, environmental, juridical and insurance impact of this innovation is huge. 8-About Algorithms, Serendipity and data freedom. Is there an algorithm for serendipity? Google is searching for it, a serendipity search engine. Maybe Microsoft is also searching this Holy Grail ( which is the Blue Swan Serendipity Generator ). They all forget an important factor and that is FREE information and that the freedom of information depends on the transmitter and the receiver. Here in the Netherlands and in most western world transmitting information is free, guarenteed in the constitution. But the problem here is filtered listening, filtered searching, filtered vision of the receiver of information. Moreover you need also endurance, sagacity besides deduction, induction and abduction ( connecting past, present and future ). Be aware of your own filter......test information that you dont like! Information comes from everywhere ( also dreams, things, animals, etc ). Connect it with your goal. Do not turn into a prisoner of any algorithm, data freedom is your own personal responsiblity. The less data freedom, the less serendipity which is also personal. You can make a chart of data freedom and inventions ( which are always serendipitious according Nikola Tesla ). That will be an eye opener. "After all, algorithms do underpin so much of our day-to-day lives. Google, Netflix, YouTube, Facebook, Spotify, and Amazon – as forerunners in the area – are obvious examples. There’s also shopping loyalty schemes, loan applications, calculating the shortest route on public transport networks, deploying police resources, stock trading, online dating, news feeds on social platforms. The list goes on. So much so, in fact, that it is genuinely difficult to escape the data-driven orderliness and step back to a simpler world where absolute chance is free to reign supreme." 1-Maximising Serendipity: The art of recognising and fostering unexpected potential - A Systemic Approach to Change. http://www.cleanlanguage.co.uk/articles/articles/224/1/Maximising-Serendipity/Page1.html Comments: Does not connect serendipity with efficiency and project into a triangle. All these words have a goal which must be reached. Comments: Unknown Unknowns are really Unknown Unknowns. As soon as you can see it, also by systematic searchig or elimination methods, it is a risk. Comments: I will contact the researcher there. Comments: Mailed Tina Lehmbeck at Sussex University. Still no answer. This research should be ready August 2016. Comments: The BSI method can also be used in other science fields like psychologie, filosophy, religion studies, healthcare, etc. Comments: I will contact the reseachers involved and point them to this paper. Comments: Maybe wikipedia should open the gate for the Blue Swan Index. Comments: Thank you Donald. You are serendipity for me when I found your statement on Google. But I also use Bing or the papers. Why?Because information must be free. Otherwise I can not be Blue Swan Efficient!! Comments: Open communication is the best for invoking serendipity. But each person has a built in filter or fire wall. Lowering this fire wall is not easy to do but it is not impossible. The Blue Swan Theory is developed for that purpose. Comments: The key to innovation is not serendipity but efficiency and as a result of that the ROI. Comments: Serendipity in the gene-world. But remember you are NOT your genes. You will controls your efficiency....which controls serendipity...which controls gene organisation? Maybe a new field for research!! Comments: A Dutch article of the famous Pek van Andel who brought the word serendipity to me in 2004. Thank you Pek. Comments: This BSI site and software will create better physical environments to increase the potential for serendipitous encounters. But it is not only the encounters!! It is much more than that.